The Financial Brand website summary of mobile banking report shows a disappointing rate of mobile payment and payment adoption among consumers. Consumer enrollment in mobile banking services is growing as more individuals rely on their mobile phones for access to financial services. While growing, the total enrollment and usage percentages for most organizations still falls short of potential. The Federal Reserve Bank study, The Mobile Banking and Payment Practices of U.S. Financial Institutions report, provides results from 706 financial institutions in the Atlanta, Boston, Cleveland, Dallas, Kansas City, Minneapolis and Richmond Federal Reserve Districts, as well as historical comparisons to previous research by the Fed. When asked for reasons why mobile payment solutions were not already offered, security was at the top of the list. 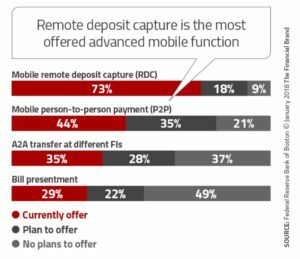 On the positive side, Remote Deposit Capture is becoming ubiquitous – – and perhaps the lever for driving widespread adoption of mobile payments. New Reg CC rules activating in July of 2018 should eliminate some of the security concerns of consumers and banks with better definitions of warranties and indemnities. OrboAnywhere Validate technologies fit well with Reg CC and UCC requirements by validating the critical fields on Mobile and Corporate RDC items. Another major consideration is Restrictive Endorsements, which will have additional importance for reducing fraud.